Just when I think it's going to be a slow day in the blog business, Charlie Sheen rises back to the surface. Bavarian beer is based out of the Netherlands, but they are making a push for the North American market with their non-alcoholic beer. Who better than Charlie Sheen to be the spokesperson. Agency is Rempen GmbH out of Germany. Ontrackblog is a division of OntrackCommunications Inc. Next up, a mini-spotlight on US agency Mullen, based out of Boston. One of its more notable campaigns was creating the Monster.com Super Bowl commercial When I Grow Up. Mullen was founded in 1970 by Jim Mullen along with Paul Silverman, who passed on in 2009 along with Joe Grimaldi. Over the years, the company grew steadily into the 22nd largest agency in the United States. Mullen is part of the Interpublic Group (IPG) of Companies. In 2011 the agency was named to Ad Age's A list as the third best agency in the country. In the same year, Fast Company named Mullen to its top 10 innovative marketing and advertising companies. Here are two spots that are real show stoppers. First up, a gorgeous piece of editing for "iRobot, do you?" Product, the robot vacuum. What better way to spotlight the product, then to reverse the tables and turn the owners into robots. I love the edit segment of the older bald actor when his head shifts up and down to the short beat of the drums. Next, a commercial for Fage Yogurt. A thing of beauty to watch. That's it for this week. Comments? We're all ears, and occasionally thumbs. Send 'em our way. And may all your creative be excellent. I was searching for interesting creative to post in this column and stumbled into some unique virals out of the UK. Britain, the land of Monty Python and Ricky Gervais can often have humour that is inaccessible to a certain North American sensibilities. But this commercial is brilliant. It's done by London's Man + Hatchet. A combination of stock footage with an animation overlay really brings the nuclear silos to life, well just before they die. And Britain shares something in common with North America, and most of the free world; a love for the Muppets. Here milk producer Cravendale does a promotional tie in with the Muppets movie. Done by Outsideline. I love love love this piece for T Mobile called "What Britain Loves". It's twisted and bizarre, which makes for a perfect viral. It was written by Dan Warner, art directed by Andy Vasey, and directed and produced by Traktor for Saatchi and Saatchi UK. That's it for this week. See something inspiring? Please pass it along and we'll share and share alike here. Have a great week, and may all your creative be excellent. The world is looking more to handheld devices to keep them connected when they're away from home or office. And video is an important part of that. There's a new video sharing site on the scene with strong roots in mobile uploading. They are described as a mobile app that allows users to capture, share, discover and view videos. They have just released a new version of their iOS app that allows users to shoot videos with visual effects and filters in real-time. 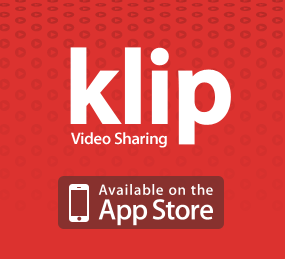 Klip has also added seven new video effects to the app. Klip has been steadily updating their app since their launch last year, including SMS functionality. Watch for more video and mobile hybrids. I'm going to see Jerry Lewis at Casino Rama tonight. One might think Jerry's performing days are a decade or so behind him. Perhaps that's the case. But I'm going for the experience. The experience of spending time with a friend I've known for 30 years, and the experience of soaking it all in. Lewis is a performer who came up in a golden era of nightclub legends. The stories alone are worth the price of admission. At 86 I'm not expecting him to do cartwheels across the stage, but if he tells one story about the golden age of Vegas performers, I'll feel it's worth it. The king of all Vegas performers of course was Sinatra. Many might argue Elvis was "the man" but he wasn't really part of the Vegas scene until the waining years of his career. This is my long segue into this week's theme, commercials from ol' blue eyes. Sinatra worked hard at his craft, but he also played hard. And to play hard you need a lot of "cheese". So he was not adverse to lending his name and talents to a variety of advertisers over his long career. Here's a classic spot, and a long one starring Sinatra and professional sidekick and pitchman Ed McMahon. Even as late as 1988 Sinatra's name carried enough weight for a major beer company to make him the showcase of their campaign. And, given it is Jerry Lewis I'm going to see tonight, it's only fair to feature one of his commercials. A 711 commercial from 1980. Whaaaaeeeee Dean. That's it for this week. May all your creative be excellent. On last week's MadMen, one of the story lines was the pursuit of the Rolling Stones to sing a jingle on behalf of one of the agencies clients. Watching a background interview with creator Mathew Weiner, he mentioned how the plot line was tied in a real life event. The Rolling Stones, in fact, recorded a song for Rice Crispies in 1963. The anti-establishment movement took a toll on pop artists singing for "the man" but this song was clearly in advance of that time. And in 1995, Bill Gates cut a check for the use of "Start me Up" for Windows 95. Get ready for some flashbacks when you see the large, clunky monitors and CD's sliding into trays. The Rolling Stones have never had an issue with separating their art with their love of the almighty dollar. Here the Stones sing the song Charmed Life on behalf of Dell Computers. Next week, as we continue our look at heritage advertising, from the age of the 60 second plus commercial, Frank Sinatra on his favourite beer. Until then, may all your creative be excellent.